1. Hadn't heard the word "dubbin" for years but in the UK territories it is used as a verb meaning to oil/wax/polish your boots (often used for football studs/cleats(US)) and many products carry the word dubbin. This Chelsea Dubbin (named after the Chealsea Pensioners not Chelsea football, though commonly used in the footy world) and is made in England as it has been for over 100 years. Leatherfood, great word. 2. Titled The Original bee's wax waterproofing, Sno Seal was created in 1933 to preseve and protect leather ski boots. Still good for all types of leather goods, dries odor free. Clean & preheat leather before application. Can use shoe polish over the Sno Seal to maintain color. Contains no silicone. The beeswax formula dries to a solid wax that "stays put" in the surface of the leather so it lasts longer apparently. 3. Scout Mink Oil: Quick & easy leather care in a handy tin. Waterproofs & helps prevent salt damage. Recommended for leather work boots. Made in the U.S.A. Is this stuff infact made by Shepler's? 5. 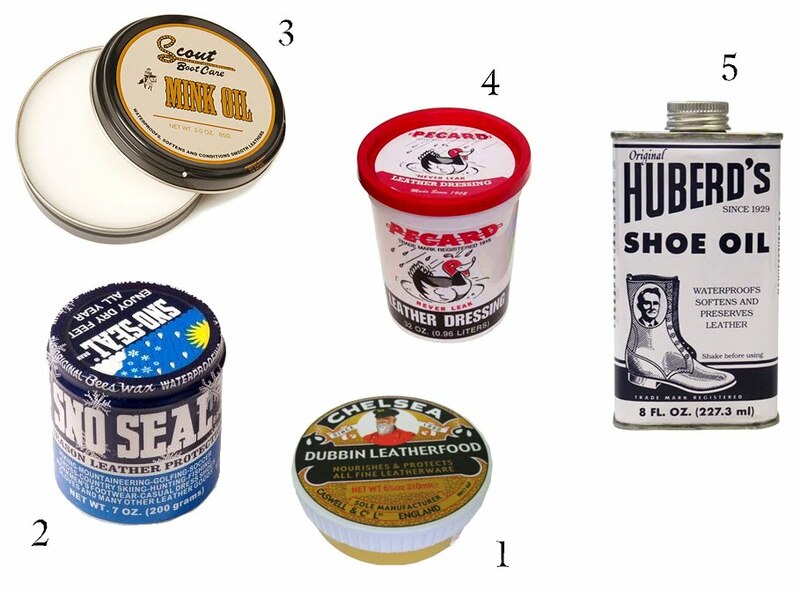 Huberd's Shoe Oil has been conditioning and waterproofing leather goods since 1929. Made with leather conditioning oil and beeswax, Huberd's Shoe Oil helps restore dried-out leather. Huberd's was founded in McMinnville, OR in 1921 by Mr. Huberd himself -he started with a shoe grease, a beeswax formula, that was perfect for loggers' boots. Ok, yes the packaging got me... but good backstory too. The great thing about all these oil/waxes is that they run around the $5 mark. You get a month of Sundays worth of shoes restoring for $5; nae bad.